Kumar Sangakkara became the fastest player to reach 12,000 Test runs and will look to rebuild Sri Lanka’s innings after they were left teetering at 78 for five at the end of the first day of the second Test against New Zealand. 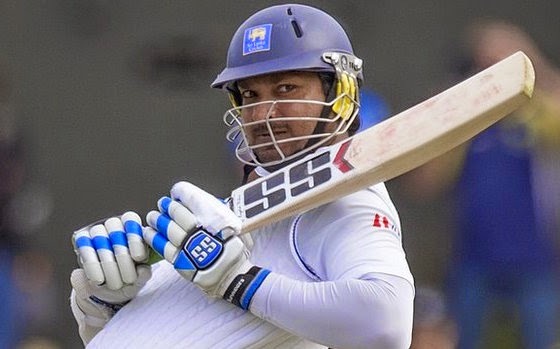 Sangakkara was 33 not out while wicketkeeper Prasanna Jayawardene was dismissed for six on the final ball of the day on Saturday in response to New Zealand’s 221 after the hosts were asked to bat on the green Basin Reserve pitch. Doug Bracewell took two quick wickets and Trent Boult another as New Zealand reduced the visitors to 29 for three then 58 for four after Tim Southee dismissed Angelo Mathews before Bracewell had Jayawardene caught in the slips on the last ball. Sangakkara had entered the game needing five runs to become the fifth man to surpass 12,000 test runs, which he achieved with two runs off his hip into the leg side off Trent Boult. Sangakkara has accumulated his runs in 224 innings, compared to India’s Sachin Tendulkar and Australia’s Ricky Ponting, who both needed 247 innings to surpass the mark. The left-hander, who spent the majority of his career also keeping wickets, was given a standing ovation by the crowd, though he barely acknowledged the milestone as he sought to settle his side’s innings. New Zealand had been dismissed just after the tea break after a collapse of their last eight wickets for 80 runs. The hosts were in control of the match having raced to 141 for two after lunch, with Kane Williamson and Ross Taylor well set. Nuwan Pradeep then sparked the collapse as New Zealand lost five wickets for 41 runs before tea with the visitors taking advantage of poor shot selection from the hosts. Williamson (69), Taylor (35) and Brendon McCullum (0) were all bowled off inside edges playing at deliveries they could have left alone, while wicketkeeper BJ Watling (11) slashed at a short wide delivery he could also have left. Sri Lanka wrapped up the tail after tea with Mark Craig and Southee also playing false shots before Bracewell and Boult produced a final-wicket partnership of 26 runs from 28 balls. Pradeep finished with career-best figures of 4-63.